Help from expert scholars in understanding the Scriptures! • What does that verse mean? • How should I interpret this passage? • What is the significance of this word or phrase in Greek or Hebrew? • How do Bible-time customs help me understand the meaning of this passage? • How can this alleged contradiction be explained? • How does the information on the author, historical background, and features of a Bible book help interpret that book? The Bible Knowledge Commentary answers these and other questions about the Scriptures, discussing all the Bible verse by verse and often phrase by phrase. In addition, maps, charts, and diagrams help you grasp the meanings of the biblical text. Unlike most others this commentary is by authors from one school—Dallas Theological Seminary. The Bible Knowledge Commentary—popular in style and scholarly in content—will deepen your understanding of God's written Word. 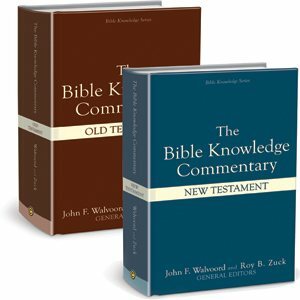 The Bible Knowledge Commentary will be welcomed by a wide spectrum of Bible students, form the beginner, who will find it easy to understand and easy to use, to the advanced, who will find it consistently thorough and reliable. The readable style, combined with careful scholarship, make this a Bible study aid I and others will add to our "most-used" shelf of books.